Pieminister – gets my vote! 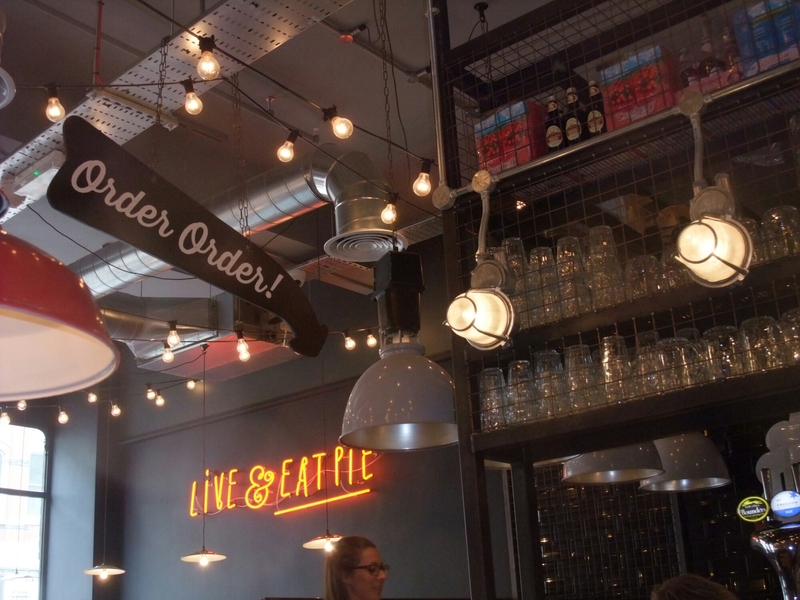 I was very happy when Pieminister opened up in Cardiff – part of an pleasingly resurgent food scene here in the Welsh Capital. I have been a fan of their pies since they opened their first shop in Stokes Croft in Bristol back in 2003. I even have their recipe book. 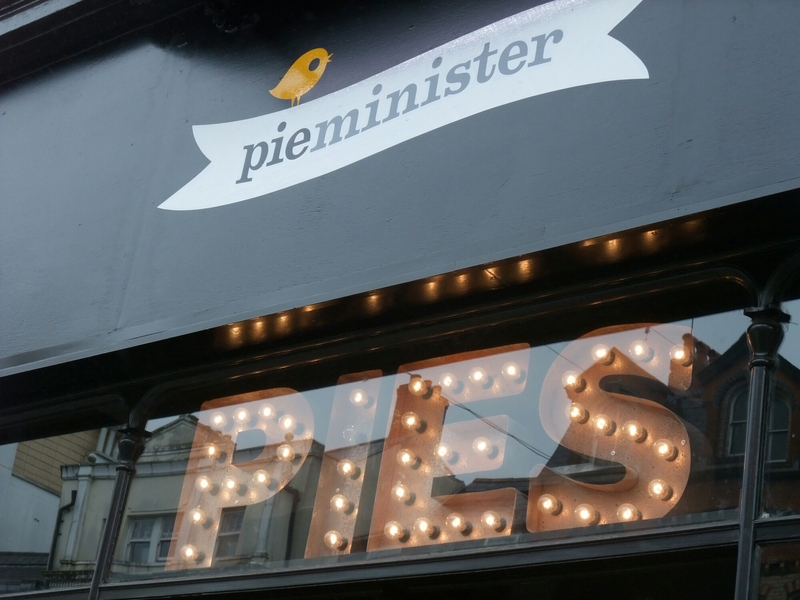 In all that time, I have never got the joke in the name, having always read it as Pieminster. I have referred to it as such many times to friends in Bristol and no one has ever corrected me. Being both dylexsic and dyspraxic, people in work are use to my somewhat idiosyncratic pronunciation of certain word (and readers may be aware of the odd typo – my Sis. loves pointing them out). Dubai is a case in point, in respect of which I have been roundly ridiculed in work for the way I pronounce it (until that is at a conference the head of our Dubai office pronounced it exactly as I do – ha Rach stick that in your pipe and smoke it!). Sapsuma ( it sounds so much better than satsuma) I hold my hand up to. So when I mentioned to the poor saps that share office space with me (I have been told it is challenging to work in close proximity to me as I am quite loud, seem to give off an electro magnetic field that causes all nearby computers, printers etc. 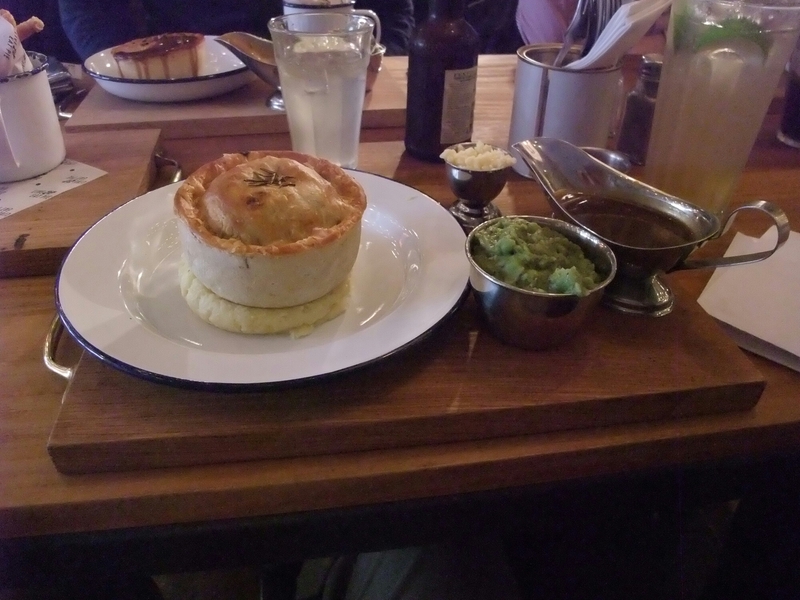 to malfunction and tend to wander when dictating, which I do a lot loudly) why don’t we go to Pieminster for lunch, I was politely (well not really) told “It’s Pieminister, you …….”. At this point (after 11 odd years) I got the joke (quite clever really) and wondered why this had not been pointed out to me before. So off we truddled to “Pieminister” (my brain still struggling to accept my 11 year mistake) to sample their pies. The menu unsurprisingly consisted of pies, pies and some more pies, with the addition of sides to go with your pies (there is other stuff). 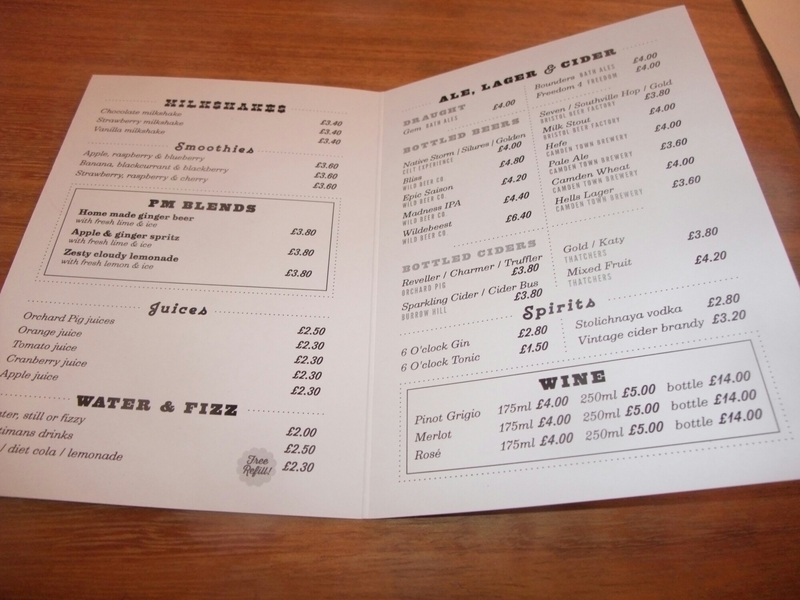 There is also a nice looking drinks menu that focuses on craft beers (great with pies) and also has a wide and good (if a bit pricey) set of soft drink options. I went for the Mothership, which (at £9) comprised of one of their classic pie, mash, gravy, minty mushy peas, grated cheddar and crispy shallots. After humming and harring for ages, I eventually choose the Kate & Sidney pie which consisted of British beef, kidney and real ale (Seven Ale from the Bristol Beer Factory to be precise). I am not usually a massive fan of kidneys, but do like a good steak and kidney pie for some reason. 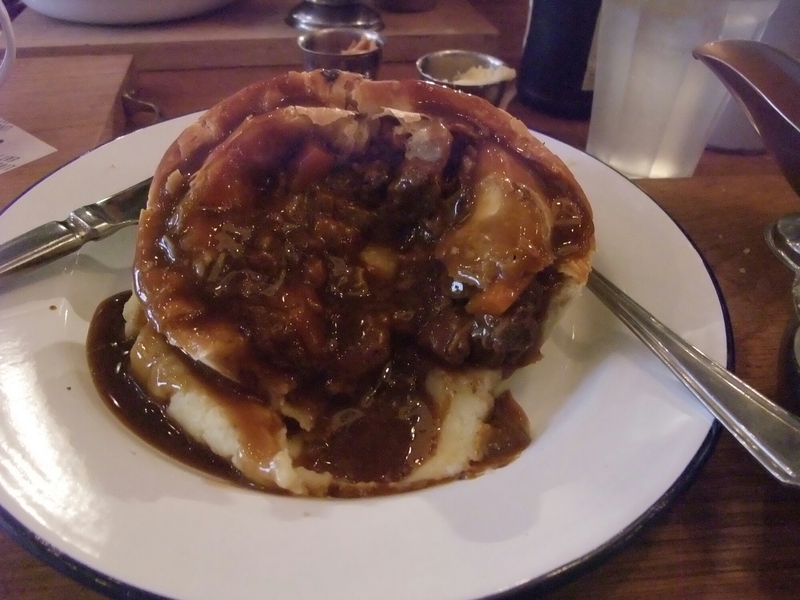 My pie was all it should have been with good pastry (I particularly liked the suet lid) and a piping hot tasty filling that had a nice steak to kidney ratio and a good amount of decent quality meat ( 100% organic, fully traceable, British beef with no gristly bits). The mash was smooth, creamy and well seasoned. Pleasingly the mushy peas were proper marrowfat peas and had a good minty hit to them. The gravy was ok, if a little bland, and I am not sure I got the point of the egg cups of crispy shallots and grated cheddar that came with the Mothership. At a pound more than the classic pie and two sides option (with sides including cheesy mash) it seemed to me that with the Mothership you pay a pound extra for an egg cup of crispy shallots (which didn’t add much to the equation in my view). Everyone else (bar from the aforementioned Rach, a friend, who has worked/put up with me for nigh on 20 years, probably knows me better than my Mum and has the patience of a saint, having not killed me – yet) had the Moo (beef and ale) pie and two sides options (both choosing sides of mushy peas and skin on chips as well as gravy). All pronounced their pie and chips as very nice. 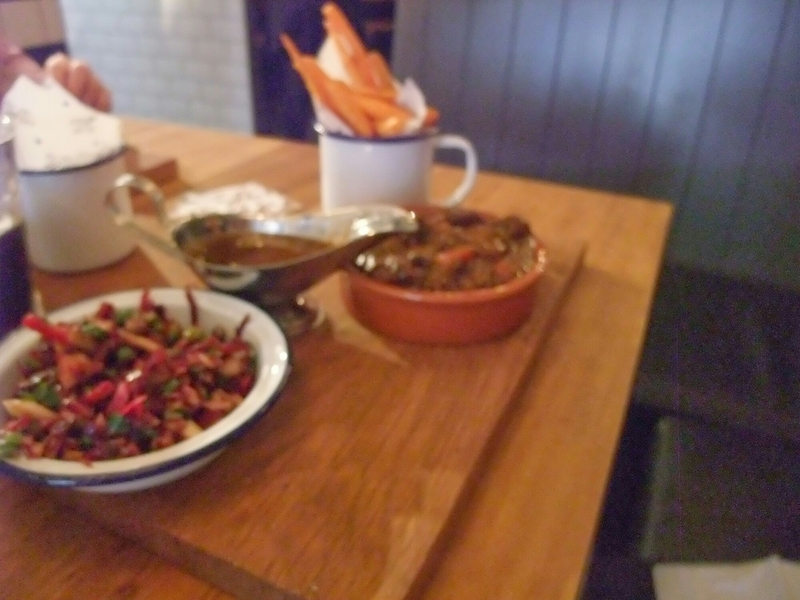 Rach, having to be different and not wanting a pie (despite me pointedly saying “It’s a bloody pie restaurant, they do pies”), went for a beef and stout pot (basically the pie without the pastry – I know I don’t get it either) with a red cabbage slaw and sweet potato fries. The slaw had a good balance of flavours and a nice crunch to it which went surprisingly well with the richness of the steak and stout pot. 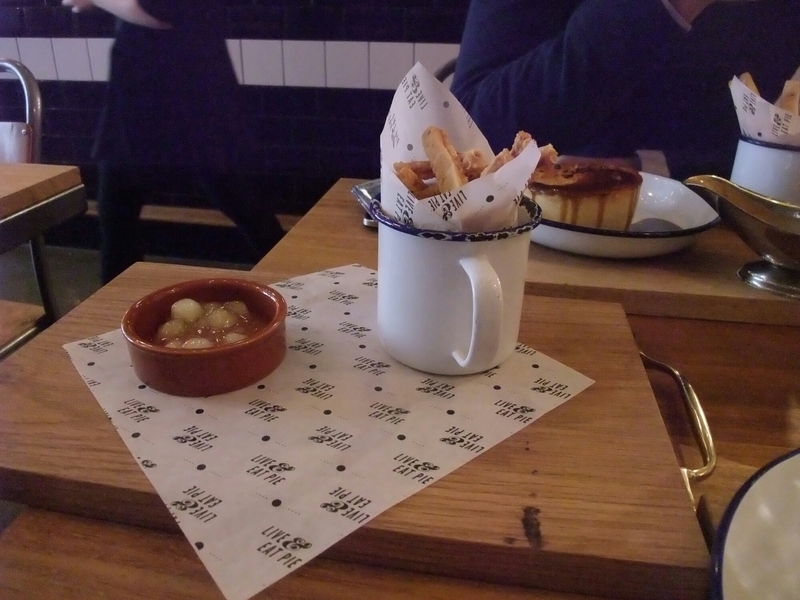 The sweet potato fries were very nice, crisp on the outside and soft on the inside and were well seasoned (I was told off for nicking too many). 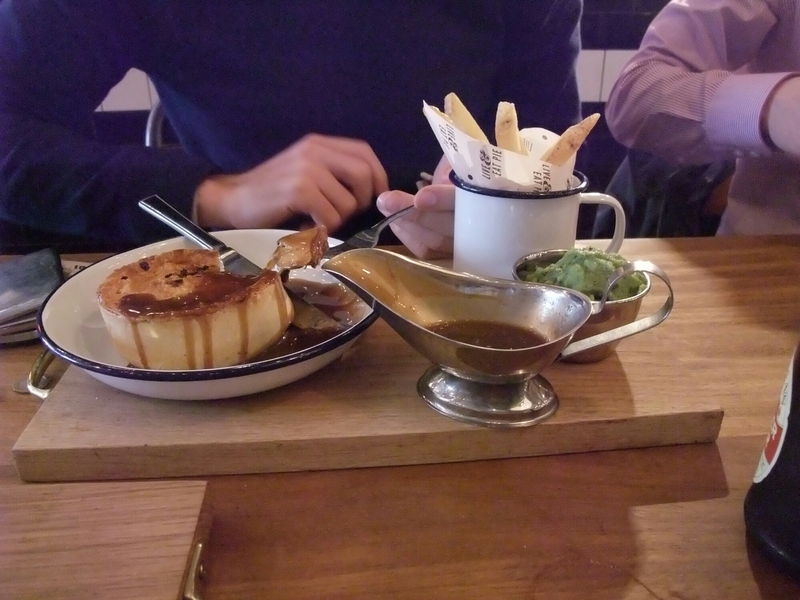 The pot came with gravy which was a bit odd as there was nowhere to pour it bar from in the pot dish which neither needed it nor could in reality accommodate it. I suppose you could dip chips in it, presuming no one in their right mind would add it to the slaw but to me it seemed a bit pointless unless you went for mash as a side. We did order pork scratchings from the “While you wait” part of the menu. Whilst these were good (they came with a somewhat non-descript apple sauce) they arrived (having sat on the pass for 5 minutes) at the same time as the pies, which rather defeated the object of ordering them. Drinks wise, as it was a working day, we were all on the soft drinks. 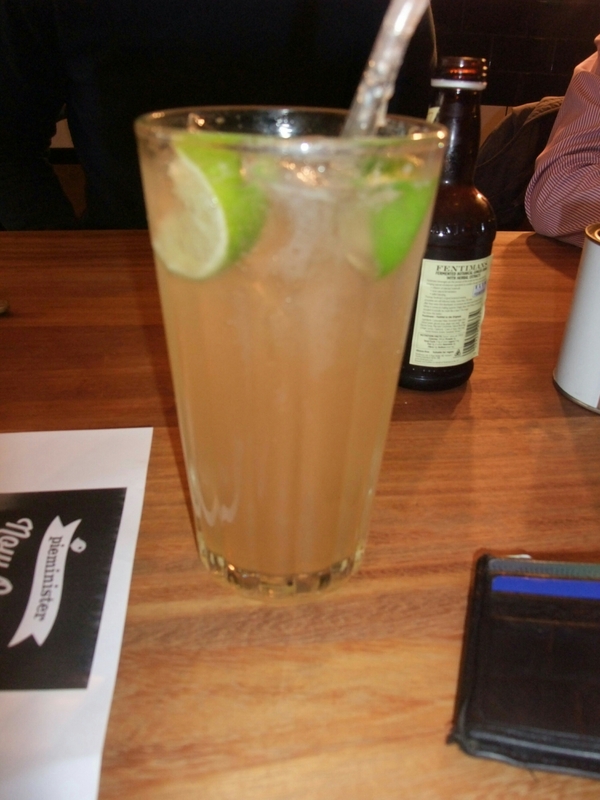 I had an PM ginger beer (for a somewhat steep £3.80 – but it was hand mixed and a good size) which was very nice with a fair whack of ginger (Rach had the same, but it was noticeable weaker than mine). The service was efficient and friendly and we were back in the office well within the hour, so this is a good work lunch option. The only small niggles with the service were the pot dish came a good 5 minutes after the food for the rest of the table arrived and the scratchings arriving with the pies. As gentlemen, none of us waited for Rach’s to arrive and on being asked how our food was (before Rach had got her meal) we said “very nice, but we are missing one”. 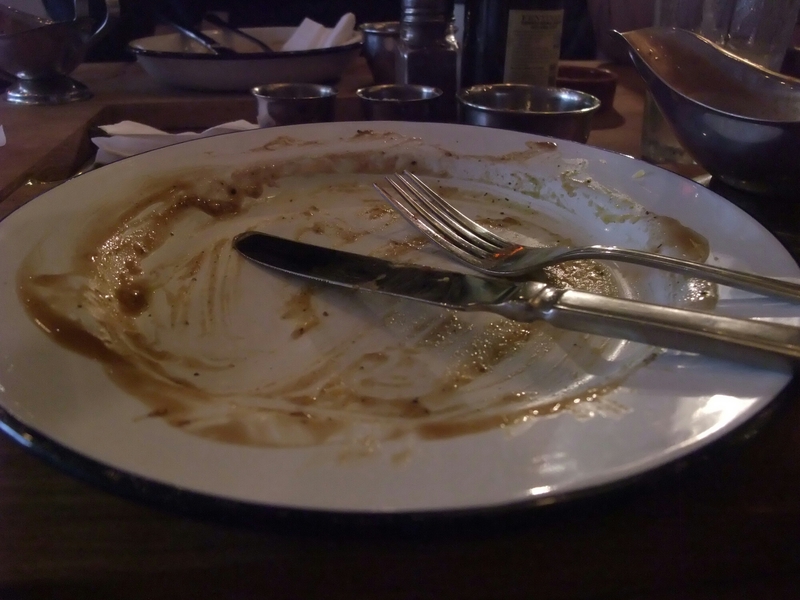 We all thoroughly enjoyed our food, with clean plates all round. The food was tasty and filling and the service pretty good, with the added bonus (for a work day lunch) of us all being done and dusted well within the hour. Rach said I should also mention that she thought the loos were nice! There where a few minor niggles (as mentioned above), but overall we were all very impressed. Price wise you are looking at between £10 and £13 a head for one of the pie and sides options and a drink. Not cheap but it is a quality product and we were all happily stuffed. On this basis, I would say it was pretty good value. We each took advantage of a £2 off voucher when you spend more than £10 (on leaving we were all given a £1 off voucher). Would I go back? Definately, the food was good and being in and out well within the hour makes this an ideal venue for a work lunch or for a meal to line the stomach before a night on the tiles (so the young things in the office tell me). 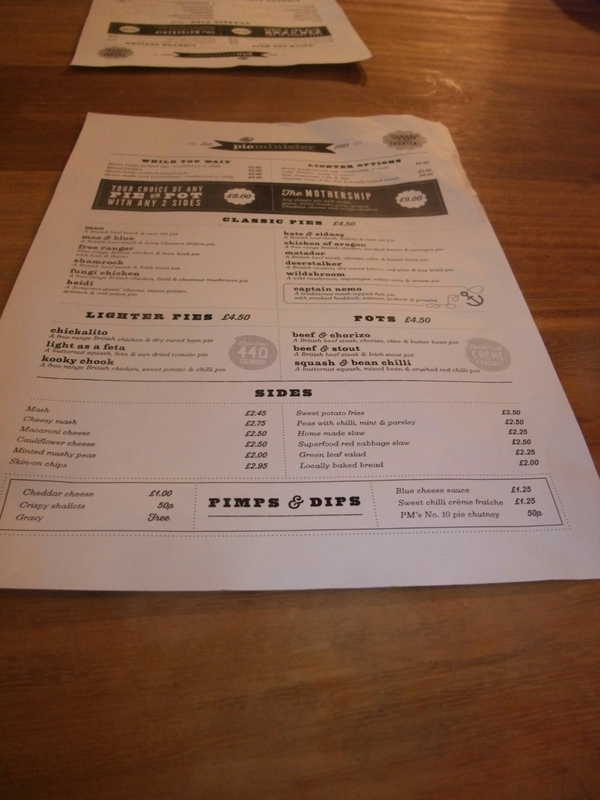 This entry was posted on May 11, 2014 by solicitingflavours in Cardiff, Food, lunch, lunchtime, Restaurant Review, Wales.